expectations and the skills required to set up an instrument and to have a job in a professional workshop. comfortable for the player. We then worked on the nut. 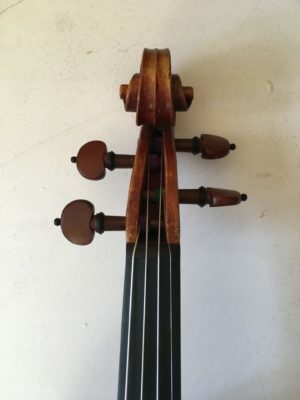 Helen showed me a very good and efficient way to make the right shape through a Strad magazine Trade Secrets article, which did help me a lot. Then I fitted the pegs and the end pin. I learnt how to use an adjustable peg shaper. I really appreciate the way it does work well and quickly on the pegs. 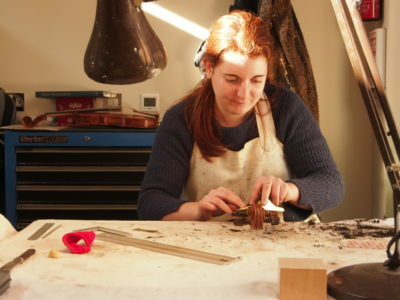 She helped me to feel and hear how well the pegs should turn so it will be easier for the player to tune his instrument. After those, we fitted the sound post inside the instrument. Helen showed me a very accurate way to prepare the sound post so it fits quickly inside the instrument. I found the use of a LED light inside the instrument and a bigger hole for the end pin very helpful to see exactly what we are doing. own way to trim her bridge. we were running out of time so I managed only to change the shape of the fingerboard and the nut.